Rangers manager Mark Warburton has expressed irritation and amazement at Ronny Deila’s view of artificial pitches, branding his Celtic counterpart “disrespectful” and stating he would be “absolutely staggered” if the Scottish champions installed such a surface at Parkhead. The ongoing debate and controversy over synthetic pitches in Scottish football took a fresh twist this week when Deila labelled their critics as “very old fashioned” and revealed he would not object to one being laid down at Celtic Park. 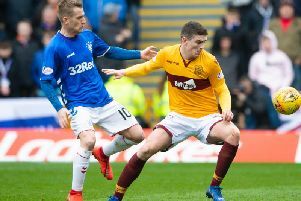 Following a recent PFA Scotland survey which indicated almost 75 per cent of professionals prefer grass pitches, Warburton has led the condemnation of artificial surfaces during a period which saw Rangers’ top scorer Martyn Waghorn suffer a potentially season-ending knee injury on Kilmarnock’s 3G Rugby Park pitch. Responding to Deila’s comments, Warburton insisted he cannot conceive of Rangers ever replacing the grass pitch at Ibrox. He also pointed out that Deila’s own assessment of synthetic surfaces was underpinned by an admission from the Norwegian that grass is superior. “If he [Deila] has said that about the old fashioned view, then it’s disrespectful because I always say that everyone has their own opinion,” said Warburton. “But there’s one line in what he said that stands out for me and that was when he said a good grass surface is No 1 and a good artificial surface is No 2. If you’re prepared to ever accept second best, then go and get a good artificial pitch. “I can’t ever imagine it would happen that Rangers install an artificial pitch at Ibrox. I saw Ronny’s comments about Parkhead and I would be absolutely staggered that they would do that. “If they do, that’s their choice, nothing to do with me, but I just think that a good grass pitch is No 1 so you get the right surface. “You look at them down south, it adds so much to the quality of the product. How many grass pitches are there down south and how many artificial pitches are there? “If you’re prepared to accept second best and take a cheaper option then go and get a good artificial pitch. But any player and coach will tell you, you cannot beat a top quality grass pitch.